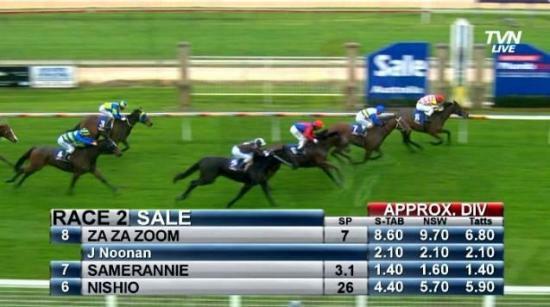 Not even unrelenting rain or low visibility could stop Za Za Zoom from winning at Sale on Sunday. Geena, as she is known around the stable, handled the wet track expertly to lead all the way from barrier 5 with Jake Noonan in the saddle. The Heavy 9 track was the deepest Geena had run on and her wet track form held true on the back of a fourth at Cranbourne on Slow 7 going. Jumping as a $7 chance in the field of eight, Tony was quietly confident Za Za Zoom would run a big race. “I thought she would be hard to beat,” Tony said. Instructed to go to the front, Jake took full advantage of Geena’s gate speed to dart forward, find and easy lead, and relax her beautifully in transit over the 1400m trip. As the field cornered, Jake held his ground by sticking to the rail while the rest of the field took the long way home by hooking wide. The ground took its toll on others while Geena relished in the going to give a big kick at the 200m marker. From there – there was no catching her as she held on for a one length win. Making the win even sweeter for connections was the race had a Super VOBIS bonus attached which Geena had been nominated for. The bonus provided an additional $6,300 to the $9,000 winner’s cheque to the pleasure of all involved. Delighting connections with her maiden win in just her third start, the win was even more exciting for breeders Nigel and Meredith Berry. The Berrys bred Za Za Zoom (by Strategic) from their mare Princess Regina but decided to retain a share in the filly which they race with close friends. The win adds additional intrigue to a weanling half-sister by super-sire Commands which is still owned by the Berrys. But in the meantime, Za Za Zoom is on track for a solid campaign and will have no problem handling the wet tracks which we are set for over the next month or two. “All going well, she might get out to 2000m down the track. She is out of a Zabeel mare and will continue to improve with age and experience,” Tony said. Congratulations to Dr Nigel Berry, Meredith Berry, Alex & Jo Berry, Jane Berry, Keith Berry, Fay Berry, Alice Brettington-Moore, Duncan Campbell, Andrew Davidson, Stuart Davidson, Peter Davidson, Joshua De Bruin, Chris Downing, Felicity Emery, Adam Keyes-Tilley, Midori Kimura, Melanie & Windsor Knox, Suzanne Lucas, James Lucas, Isobel Lucas, Vanessa McCullagh, Catriona & Ben McLean, Shirley Moloney, Mark Norris, Jody Pederson, Lisa & Tom Perry, Ray Tanti and Sally-anne Tilley for the win.